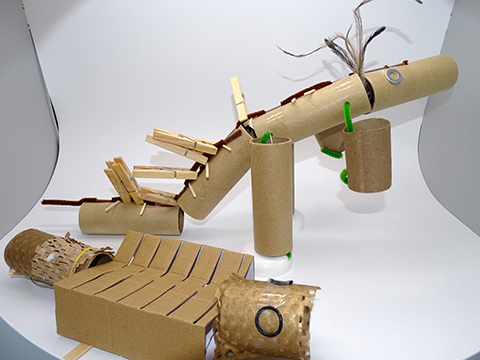 Create your own herd of extinct and imaginary animals from found and recycled materials. Did you know … Australia had dinosaurs? Today they are all extinct but they roamed around over 100 million years ago. Can you imagine what Australia was like then? Skeletons have been found in the Queensland town of Muttaburra (and elsewhere) and this dinosaur became known as the muttaburrasaurus. 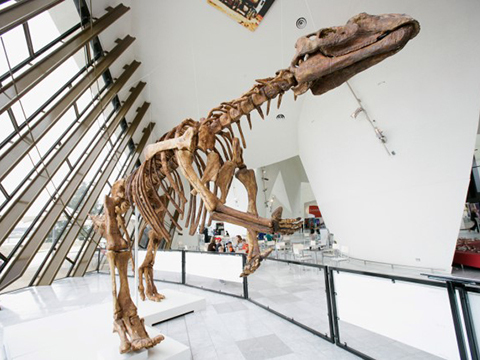 At the National Museum of Australia we have a large replica of the muttaburrasaurus in the Gandel Atrium. Sadly, today many of Australias unique and special animals are endangered or extinct. You can find out about some of these at the Museum, including the thylacine and the muttaburrasaurus. Contact one of your local conservation organisations to see how you can help. Help plant trees or plants that support local animals and insects. Become an ecowarrior and learn how to recycle so you can lessen your impact on the environment and help animals survive. 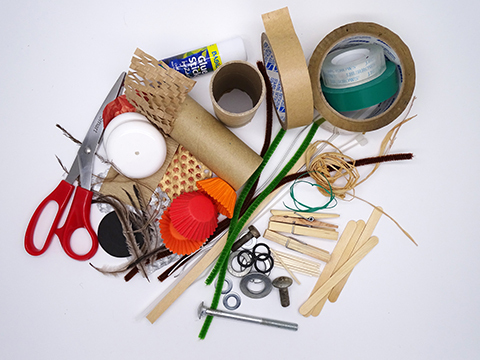 Look around your home for found and recycled materials and make your own thylacine, muttaburrasaurus, diprotodon or an animal on today’s endangered list. Or make up an imaginary animal that might have once existed. Local Canberra artist Tom Buckland makes artwork out of recycled waste and reuses common materials. He calls himself a voracious bricolagist (this is an art term for constructing or creating art from found objects). 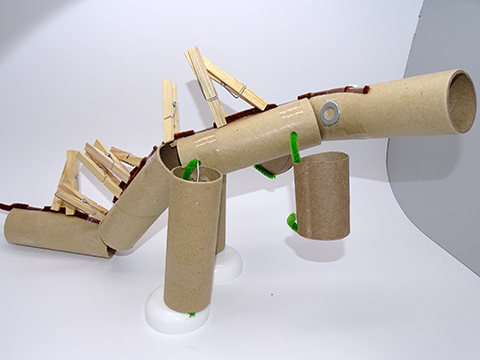 Tom has created a muttaburrasaurus to help inspire you to make your own extinct animal at home. Less than 40 minutes. Moderate — you may need an adult helper when using scissors or staplers. Pencils or textas to decorate. Look online and research the muttaburrasaurus or other endangered animals. Find images and learn a little about what you are making. What did the muttaburrasauraus eat? What does it tell you about Australia's past? Look around the house to see what you can use. These three tubes will make the body. 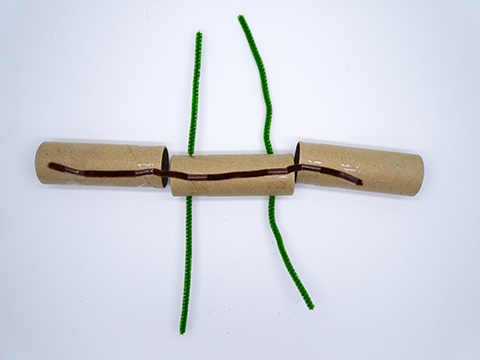 Body: Join the pieces together using a pipe-cleaner and sticky tape. Limbs: Mark on the tube where you want the legs. Ask an adult to make a small hole where they go (with a screwdriver, scissors or a sharp object), then thread your pipe-cleaners through the holes. 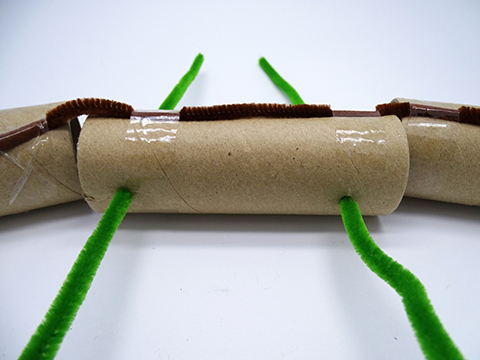 Tail — add 1 x tube. You are almost getting to the decorating stage. 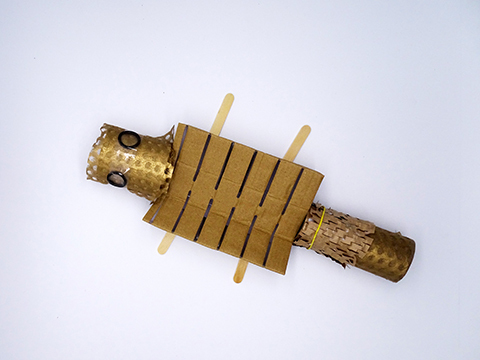 Before you do, bend the legs and, using the same technique, attach more tubes — one for a head and one or two more tubs for a tail. Be creative with your designto give your muttaburrasaurus (or other animal) some personality. 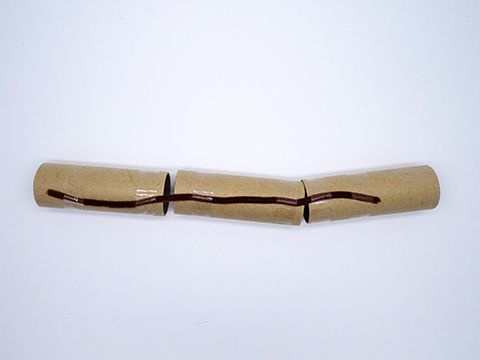 You can add extra elements, like small toothpicks, more pipe-cleaners, and use collage or pens and pencils. Don’t forget to to give your creature eyes. We also made an endangered turtle.